Christmas is a very special time, steeped in history and traditions, one of the most popular of which is the joyful Christmas carols that we sing. 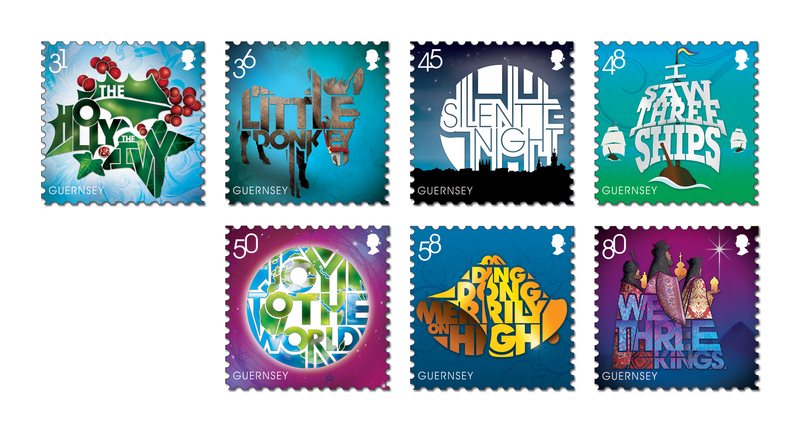 Our Guernsey Christmas Carols stamp issue features seven popular Christmas carols represented graphically with clever and contemporary use of typography. Our 31p stamp shows the beautiful green and red of the holly and ivy. Dating back almost 1000 years, the carol 'The Holly and the Ivy’ is believed to have Pagan origins. The popular carol ‘Little Donkey’ is depicted on our 38p stamp. Written by English hymnwriter Eric Boswell it describes the journey by Mary the mother of Jesus to Bethlehem on a donkey. ‘Silent Night’ is another Christmas favourite and was originally penned as a poem by Austrian priest Joseph Mohr. Depicted on our 45p stamp as a shining moon overlooking the skyline of St Peter Port, Guernsey; this is now one of our most famous Christmas carols. The English folk carol ‘I Saw Three Ships,’ which is thought to come from the 15th century is illustrated on our 48p stamp. There are several versions of this song which oddly mentions ships sailing into the landlocked city of Bethlehem. Penned by Isaac Watts in 1719, 'Joy to the World' is shown on our 50p stamp. It is one of many hymns and carols written by Watts who was awarded the degree of the Doctor of Divinity by the University of Edinburgh. Finally our 80p stamp features a beautifully jewelled crown to illustrate the carol ‘We Three Kings’. This song is based on a story from the Bible which tells of men who travelled many miles guided only by a star in order to see the promised Messiah. We hope you enjoy our Guernsey 2010 Christmas Carols issue and we wish you a very Merry Christmas.